It’s worth doing your research before choosing a sink. As craftsman Chris Gleason writes in his 2010 book Kitchen Makeovers for Any Budget, most home owners rarely replace their sink, so you’ll probably live with your decision for decades. If you already own and use a dishwasher, double-bowl sinks may lose their appeal, as Gleason writes, since the divider becomes a hassle when soaking large pots. “We found a nice single-bowl stainless sink and haven’t looked back,” says Gleason. Steel is popular partly because it tends to be durable, but quality differences mean that prices can reach $1,000. Aside from style and finish, thickness affects how much you pay. “Generally, thicker steel is considered more desirable because it is less prone to denting, flexing and noise transmission when heavy pots are clanged around in it,” Gleason writes. 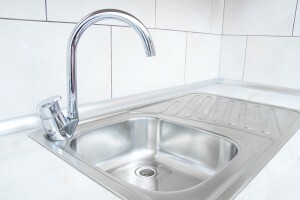 Most sinks come in 18-, 20-, or 22-gauge steel. The lower the gauge, the thicker the steel. Here’s an example of a large 18-gauge steel offering from Elkay Signature. This one’s an “undermount” design, meaning that no seam is visible between the countertop and the sink. This popular variety of sink has a number of advantages, writes home designer Terence Conran. Their enamel tends to retain its glossy lustre for years. The iron is “heavy and sturdy and come in as many colors as paint,” he writes, adding that porcelain glazing is easy to clean. But he cautions that the enamel finish can be somewhat fragile: “a heavy frying pan can chip it, rusting the cast iron beneath. Serious stains must be bleached.” Here’s a popular double-bowl model by Kohler. Certain materials can add a distinctive touch to your kitchen. One style featured by writer Peter Lemos in his book Kitchens for the Rest of Us is the soapstone apron sink similar to those featured in this article from Houzz. “Soapstone us soft, warm, natural, and traditional but resistant to all sorts of food stains and acids,” writes Lenos. This option is higher on the price scale, usually starting around $1,000. Some high-end models go beyond the basic water-holding requirements of a sink. Worktop sinks by Julien serve as an “all-purpose workstation with a built-in soap dispenser, utensil holders, even a knife block,” writes Lisa Cregan in her 2012 book Kitchens.